Crooked Willow Farms is a premier wedding venue located south of Denver in Larkspur, Colorado and offers a multitude of ceremony and reception spaces. 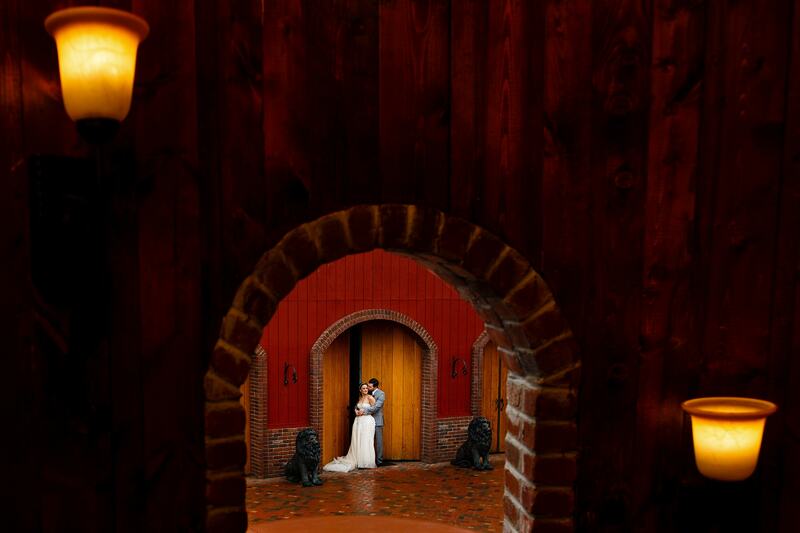 The Venue at Crooked Willow Farms provides limitless options on your wedding day. The bridal suite and groom’s lounge are large enough to host the biggest wedding parties. Your rental includes exclusive access to the venue for 12 hours. In case of poor weather, the indoor barn loft space is among the best “backup plans” we’ve seen. The market light covered courtyard is an excellent location for your first dance together. The venue can accommodate up to 250 seated guests for a wedding reception in the great hall, 100 seated guests in the courtyard or 100 seated guests in Lola’s Loft. The lawn space next to the Carriage House has views of the mountains for the perfect ceremony location. Tall ceilings, unique spaces like the barrel room and the landscaping all create a grand feel to the venue. It's beautiful inside and out and the photo locations are endless on the property. Make sure to take advantage of the opportunity to sneak out for photos or plan your first dance at twilight to capture that fairy tail feel.